Jenn’s mom Randee is a good friend. Whenever we see each other, we end up talking far too long about all kinds of random things, but the topic usually revolves around our kids. So, when she told me that her daughter Jenn, who has a smile that lights up a room, was getting married to her love Chad, I crossed my fingers that they’d ask me to do their flowers. No pressure, or anything. 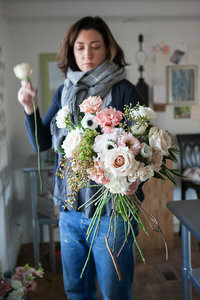 I never assume just because I know someone that they’ll want me to do their flowers because flowers might not be all that important to them on their wedding day, and if people hire me, flowers ARE a priority for them. Lucky for me, Jenn LOVES flowers. She described her vision for her day as being “casual” and “fun”. She wanted big floral moments but she also didn’t want anything that felt out of place with the taco truck they had hired to cater the event. So, we focused on the ceremony florals, the personals, and the head table, and then we kept it simple everywhere else to serve her vision and compliment their ranch venue. Jenn and Chad’s wedding was in August, so they chose a seasonal color palette of orange, apricot, burgundy, sage, and turquoise which meant that I got to bring all kinds of juicy late Summer blooms into their florals like dahlias, zinnias, strawflower, daucus carota, celosia, blackberry, and scabiosa, mixed in with hops, her beloved succulents, roses, ranunculus, hanging amaranthus, and eucalyptus. The end result was super yummy, fun, and casual, just like the rest of their wedding. 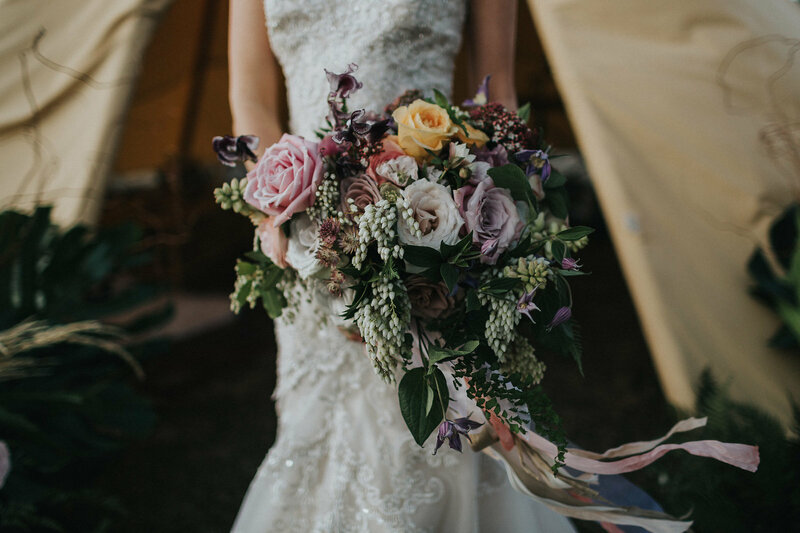 I chose a grouping of cascading ribbons in various silk fabrics, weaves, and widths, to pull in all of the colors of her color palette and then she finished her bouquet with a family heirloom that Randee gave her to honor her family and native Alaskan heritage. And this is Chad, who I don’t know, but any dude who can pull of glasses like this (and on palette, I might add) is awesome in my book. He and his men were not messin’ around in their dapper 3 piece suits, even in the heat of August. 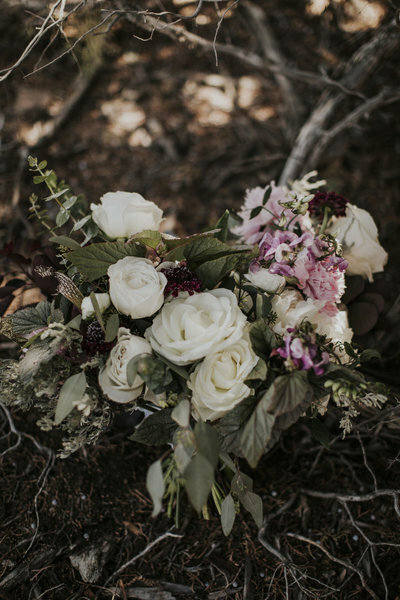 The couple were married on the banks of Rock Springs Ranch’s pond between two whisky barrels that we topped with epic garden-inspired floral arrangements dripping with hops. And right after their vows, the party started, when out came Chad’s glasses. El Sancho kept the guests fed with their killer tacos. Guest tables were dressed with groupings of vintage bottles filled with flowers to keep the reception casual and non-fussy. The bridal party displayed their bouquets along the center of the head table which had a textured garland filled with blooms . I personally think tacos should be served at every wedding. Don’t you agree?